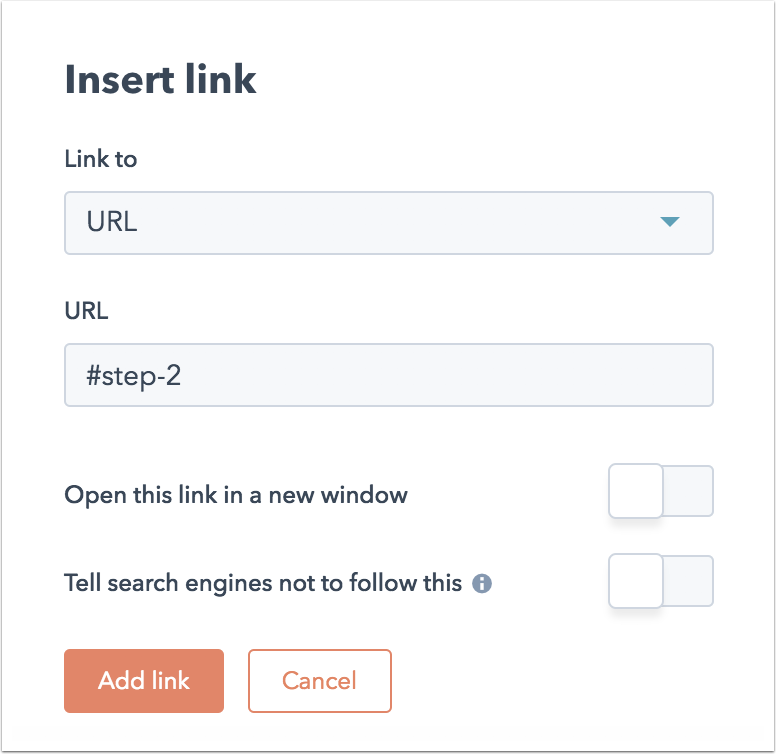 Use anchor links to help your visitors navigate to a specific section of your content without scrolling. Please note: it is strongly recommended not to use anchor links in emails as anchor tags don't work in all email clients. Anchor links also won't work in the email preview in HubSpot. In your HubSpot account, navigate to landing pages, website pages or blog. 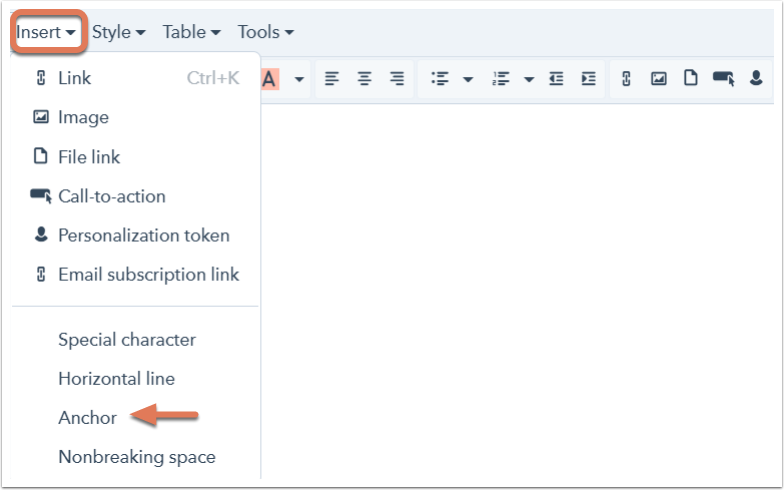 Hover over the page or blog post where you want to add an anchor, then click Edit. Click the location you wish to insert the anchor. In the example below, the anchor is placed just before the text Step 2. In the rich text toolbar, click Insert > Anchor. In the rich text editor, click Insert > Anchor. Give the anchor a name, which will be included in the link URL. Do not include a # symbol in the name of the anchor. If you want to use more than one word for your anchor, separate each word with dashes (-). In the example below, the anchor is named step-2. Then, click OK. The anchor will appear in the location you clicked into. Next, create the link that sends the visitor to the section of the page where the anchor was inserted. Highlight the text to hyperlink in the content body. In the example below, skip to step 2 is highlighted. When the text is highlighted, click Insert > Link. In the rich text toolbar, click the link iconlinkd. If the anchor you are linking to is on the same page as your link, enter the # symbol followed by the name of the anchor in the URL field. In the example below, #step-2 is entered in the URL field. If the anchor you are linking to is on a different page as the link, include the URL of the page followed by the # symbol, followed by the name of the anchor. For example, http://offers.hubspot.com/product-guide#step-2. If a visitor clicks this anchor link, they will be redirected to the section of the page or blog post where the anchor was placed.